So you’re in the market for an Apple iPad, and you have to make a decision. It’s a boxing match; with the featherweight iPad Mini vs the iPad 4th Generation, more accurately described as the hulking 652-gram gorilla in the ring. As always in the mobile computing arena, there are more features to consider than just size, however. These include individual specs like weight, screen size, resolution, protection, processing speed, as well as comfort and – of course – price. Putting them in direct spec comparison with each other is the easiest way to make a determination since both devices will be running nearly identical operating systems based on the latest version of Apple iOS 6. We’ll be comparing the iPad 4th Generation versus the iPad Mini, because this model of the Mini includes a rear webcam, as does the iPad 4. To start off with the obvious differences, the Mini’s dimensions of 5.3 in x 0.28 in x 7.87 in are deliciously smaller than the now seemingly bulky iPad 4th Gen’s 9.50 x 7.31 x 0.37. Translating that into a digestible number, that’s a difference in thinness of 23%. When considering weight, there is a notable difference as well. The iPad Mini weighs just .68 lbs., about 50% lighter than the iPad 4. While some people do prefer heavier hand-held devices, when it comes to tablets over 7 inches in size it makes sense that lighter is better. A heavy tablet might feel great in the store for the ten or so minutes that you test it, but after a few hours holding it up in a tight spot your opinion may change dramatically. Are you looking for a mini laptop with beautiful graphics? If the resolution is important to you, you can’t get much better than the retina vision of the iPad 4. At a screen resolution of 2048 x 1536, it is already double the resolution of the iPad Mini. The iPad 4 is a clear winner in this department. Both devices come with equipped with top-of-the-line dual-core CPUs, but an important difference to note is the more powerful quad-core GPU featured in the iPad 4. For those who absolutely need a fast video card for whatever reason, it would be an easy choice between them (hint: it’s not the Mini). There isn’t a huge difference for casual application use though (they’re both blazers), so for the majority of tablet users we’ll generously call it a draw. The new iPad is more of a desktop computer. There’s not really a unique “feel” per se. This is unlike the iPad Mini, whose size and thin beveled edges are spot on for texting in portrait mode, while in landscape mode the thicker bevel affords a good solid grip. The best cases available for the iPad 4th Generation are leather and double as a stand. They come in a rainbow of colors. The leather casing varies in look and feel from the fabric cover of the iPad Mini so much that this is a case of apples vs. oranges. They really are two different species, as protection goes. The iPad Mini’s magnetized fabric cover rolls onto the screen, and crisply “locks” into place. Its tri-fold ability allows it to double as a stand for viewing pictures in portrait mode, or as a keyboard stand for typing. Both are incredibly versatile protection for their respective devices. We consider this a win-win. Both the iPad Mini and the new iPad 4 sport Wi-Fi up to 802.11n, have a 10 hour battery life, and feature 5 megapixel iSight cams (and 1080p video). No one-upmanship here. The iPad fourth generation prices out at a minimum of $499 and for the iPad Mini pricing begins at $329. Ballpark, it’s about a $150 difference in cost, so the iPad Mini looks very attractive from this point of view. The iPad Mini wins out in the mobility wars. Its smaller size allows you to comfortably slip it into a purse or large jacket pocket. Less can be said about the iPad 4. What do you want to do with this device? Are you looking for that desktop computer feel? 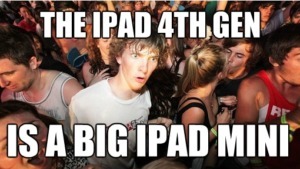 If so, you want the iPad 4th Gen. The iPad 4’s competition includes the Think Pad Tablet 2 and HP’s Elitebook. Are you looking for a smaller device that allows email, text, and reading books and magazines, yet has the screen size and processing power to play games without eye strain? Then the iPad Mini is your friend. A couple of the Mini’s competitors are tablets such as the Kindle Fire and the Nook. So if you’re an executive or graphic designer looking for a lighter laptop to use outside of the office, the new iPad is probably what you are looking for. With its blazing fast video card, Retina Vision, and higher resolution screen it should serve you wonderfully in the comfort of your home. On the other hand, if you need a more portable device for on-the-go entertainment, then the iPad Mini – although less advanced – will easily satisfy your craving for reading, gaming, and social media browsing when you’re out and about. Bottom line: Why not both?